This self catering apartment on Pueblo Torviscas Tenerife, is a penthouse on the 3rd floor and enjoys a sea view. One of our apartments to rent on Pueblo Torviscas Tenerife. 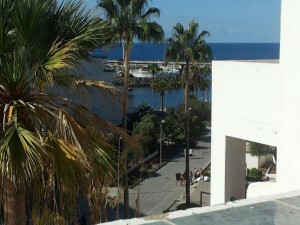 This penthouse apartment is on the 3rd floor and enjoys a sea view. We have just returned from a lovely holiday on the Pueblo Torviscas complex, which we booked through Karen from Holidays 4U. Would recommend both Karen and the complex. We really enjoyed are long awaited break. We sampled the food at the Clubhouse which was very nice. It is open at lunchtime and in the evening. The apartment was spacious and clean when we arrived. The balcony had a sea view and was furnished with a patio table and chairs. So we were able to eat and drink while watching the amazing views. And of course the balcony was very sunny as it was sea facing. Actually this is our 4th visit to this complex. But a lot of other couples that we met on the complex have been coming here for more than 15 years. Infact the sign at reception as you check in says “Welcome Home”. I can see why! I stayed in a studio on Pueblo Torviscas with my partner for a couple of weeks last month. The studio had a pool view. It was very tastefully furnished in a modern style. The sofa was very comfortable. The complex is in a great location and is only a few minutes walk to the beach and the seafront promenade. The pool on the complex is heated in the Winter months and there is a very nice pool bar which serves some good quality snacks. The staff on the complex are very friendly and helpful.